One hundred CSA/Farmers Market farmers adopt goldenberries as an annual fruit that easily fits their standard vegetable rotation as a solanaceous crop. Each farm produces and sells 50 pints per week for 6 weeks at $4 per pint on 0.25 acres each increasing total gate value by $120,000 per year. Fruit is often not grown by CSA and farmers market growers due to their relatively small size and the long-term investment and greater input required for perennial and biennial fruit crops. Goldenberries (Physalis peruviana) are small, marble sized annual fruit native to South America with a tropical flavor that are eaten raw, made into jam or jelly, or dried. 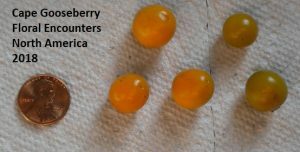 Goldenberries produce abundantly in temperate climates and fit standard crop rotations as a Solanaceous crop, however, guidelines for the US are non-existent and US production is minimal. We have grown goldenberries for 4 years and have verified their production potential in this region. 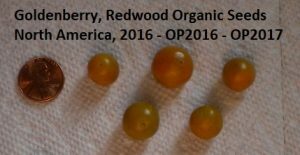 Our knowledge combined with production recommendations from South America will produce the first Sustainable Goldenberry Production Guide for the US. We will evaluate nutritional value, production practices and consumer preference to identify germplasm for use in cultivar development and begin selection of superior strains. If growers adopt goldenberries, their farm income would increase without the major expense a traditional fruit crop would incur. We will encourage goldenberry production by CSA and farmers market growers of the Northeast by providing them germplasm, a Sustainable Goldenberry Production Guide and production updates via presentations at growers meetings. A ready market exists for the fruit via The Pichuberry® Company, a marketing enterprise that has trademarked the name Pichuberry® for goldenberries and has created the American Pichuberry® Association to support growers that would like to adopt the Pichuberry® as a new crop. They are creating a demand for the fruit and are engaged in marketing many goldenberry products. Introduction of the goldenberry as an alternative annual fruit crop by 100 farmers on 0.25 acres each would significantly contribute to sustainability of small farm agriculture in the Northeast. which enhance productivity and developing superior cultivars utilizing traditional breeding methods. Invitations to participate in evaluating goldenberries as a new novel fruit were sent via e-mail in February 2018 to 2074 growers in the northeast region. 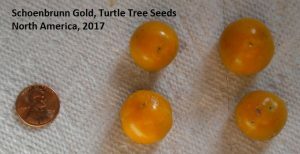 Participating growers received two goldenberry genotypes to evaluate: ‘Cape Gooseberry’ from TradeWinds Fruit Company and ‘Schoenbrunn Gold’ from Turtle Tree Seed Company. Each grower received 25 seeds of each genotype and was provided instructions for production. Since commercial production of goldenberries is non-existent in North America, growers were provided estimates of best production practices based on information from South America. Growers were also provided an electronically delivered pdf of the ‘Goldenberry Fact Sheet’ (Fact Sheet Project LNE18-362) which was approved by SARE on 04/24/2018 by Candice Huber. Growers were asked to grow 10 plants of each genotype and provide feedback regarding growth habit, ease of production, productivity and fruit quality. Thirty globally sourced goldenberry genotypes (Table 2.1) were evaluated in a randomized complete block experiment replicated 10 times at Horticulture Farm 3 of the New Jersey Agricultural Experiment Station on Ryders Lane in East Brunswick, NJ during the 2018 growing season. Some of the selections evaluated were the same genotype acquired in different years from the same source, or open pollinated selections saved from previous acquisitions. Sources, year of acquisition and known pedigree history are presented in Table 2.1. Fruit were harvested and counted in early October and samples evaluated for fruit size, fruit color and production consistency regarding color and size. Production potential was estimated by multiplying the number of fruit produced per plant by the average fruit size obtained from samples. Color and production consistency were subjectively and visually evaluated by the principal investigator. Due to the nature of production (very long growing season, large planting, fruit maturation just prior to forecast hard freeze) not all plants of all genotypes were harvested, however, at least 5 plants per genotype were evaluated. Data were analyzed via an analysis of variance with mean separation performed using the REGWQ procedure when appropriate. Table 2.1. Goldenberry (Physalis peruviana) genotypes evaluated at Rutgers University during the 2018 growing season. Two goldenberry lines (Cape Gooseberry, Tradewinds Fruit, and Schoenbrunn Gold, Turtle Tree Seed, both obtained in 2018) were evaluated in a field experiment replicated 5 times at Horticulture Farm 3 of the New Jersey Agricultural Experiment Station on Ryders Lane in East Brunswick, NJ during the 2018 growing season. The two genotypes evaluated in this experiment were selected based on observations from previous goldenberry trials at Rutgers. These two genotypes were also sent to growers for evaluation in experiment 1. Genotypes were evaluated on white and black plastic mulched raised beds, with or without trellising via a simple two wire trellis using T-stakes and heavy duty twine, with or without pruning to the first bifurcation of the main stem. The experimental design was a split-split-split plot with mulch color as main plot, trellising as sub-plot, genotype as sub-sub-plot and pruning as sub-sub-sub-plot. The experimental unit was a three-plant plot. Data collected from the middle plant in each plot was used in the data anaysis. Fruit were harvested and counted in early October and samples evaluated for fruit size, fruit color and production consistency regarding color and size. Production potential was estimated by multiplying the number of fruit produced per plant by the average fruit size obtained from samples. Color and production consistency were subjectively and visually evaluated by the principal investigator. Due to the nature of production (very long growing season, large planting, fruit maturation just prior to forecast hard freeze) not all plants were harvested, however, at least 4 plants per treatment combination were evaluated. Data were analyzed via an analysis of variance and means separated via Fisher’s Protected LSD, when appropriate. Two hundred four growers participated in on-farm goldenberry evaluation in 2018. Thorough grower evaluation of the two genotypes was limited in that many growers reported that they did not harvest ripe fruit. Two major factors contributed to this: (1) the long growing season required by goldenberry and (2) many growers did not receive seed until mid-March or later. Notification of funding occurred in late February, thus seed purchasing, grower invitation e-mailing and seed shipment to growers was later than desired. Seed will be shipped to participating growers in February 2019. • Seed was sown May 10, 2018 and transplanted to the field on black plastic mulch with drip tape on June 5, 2018, as part of a larger Husk Cherry Trial. • Plants grew well throughout the summer, reaching over five feet by mid-September. Plant growth was vigorous, and plants were wide and healthy, with very dark green leaves and little/no evidence of disease throughout the growing season. • Fruit were very slow to ripen – September 10 was the first date for ripe fruit. Yield data was not collected as plants matured too late in the season. There seems to be a large amount of plant biomass relative to the amount of fruit produced, especially when compared to ground cherry varieties such as Goldie. • Flavor got mixed reviews from tasters – some appreciated the unique flavor while others found it unpleasant. • No significant differences were noted between the two Goldenberry strains for plant habit or flavor. Based on general e-mail interactions with growers, many of them enjoyed participating in this work. Unfortunately many of them did not submit comments regarding field performance of the two lines we sent them. Perhaps it was the lack of productivity especially in more northern areas due to a late start and a poor to perhaps fair growing season. I think this might have discouraged many of the participants. The number of fruit, average fruit weight and estimated potential yield per plant are presented in Table 2.2. Table 2.2. Number of fruit, average fruit weight and estimated production per plant for goldenberry genotypes evaluated at Rutgers University during the 2018 growing season. zMean separation via REGWQ test, ∝ = 0.05.
yFruit size not measured in Experiment 1 / yield not estimated. Three of the 30 genotypes evaluated were not goldenberries (Table 2.2). They were ground cherries. Variability among goldenberry genotypes was limited with respect to fruit size, number produced per plant and estimated yield. Two fruiting ‘types’ could be discerned among the 27 goldenberry lines evaluated: (1) genotypes producing smaller, marble sized and shaped fruit weighing approximately 2 – 3 g each and (2) genotypes producing larger, more irregularly shaped fruit weighing 5 – 6 g each. The average number of fruit per plant ranged from 9 to 134 and smaller fruited genotypes generally tended to produce more fruit per plant compared to larger fruited genotypes. Yield per plant ranged from as low as 50 g per plant (~0.1 lb) to as high as 756 g per plant (1.6 lbs per plant). These yields are exceptionally low based on an evaluation of similar germplasm in 2017 which produced from 300 to 2,000 g per plant (0.6 to 4.4 lbs per plant). The average fruit size in 2017 was approximately 4 g per fruit for the smaller fruited genotypes and 9 g per fruit for the larger fruited types. In 2017 fruit number per plant varied from an average of 67 to 516 fruit per plant depending on genotype. Based on personal observation and impromptu evaluations by visitors to the farm, the larger fruited genotypes had a more fruit-like, tropical flavor compared to the smaller fruited genotypes which often had a background bitter flavor. The bitter flavor did not make the smaller fruited genotypes undesirable, it was simply a discernible flavor characteristic. However, the larger fruited genotypes received more favorable comments than the smaller fruited genotypes with respect to desirability. Several of the genotypes exhibited exceptionally consistent and attractive fruit shape and color (golden yellow/orange). The two most desirable genotypes were (1) Golden Inca Berry – The Rare Vegetable Seed Consortium (no longer available from original source) and (2) Cape Gooseberry – Rare Exotic Seeds 2016 (still available from source, December 2018). Four other genotypes were attractive and well-colored, but they were not as nice as the two previously mentioned genotypes: (1) OP PI232077 64GI1 SD – USDA ARS GRIN 2015 – OP 2015 – OP 2016, (2) OP PI291561 95GI1 SD – USDA ARS GRIN 2015 – OP 2015 – OP 2016, (3) Giant Cape Gooseberry – Baker Creek Heirloom Seeds 2016 – OP 2016, and (4) Cape Gooseberry – Herbs4Health 2018. Genotypes producing inconsistently colored fruit are presented below for comparison. Note the variation in fruit color, size and general appearance. Even though one of the most highly colored and consistent genotypes is no longer available from the original source, we have saved seed from each line, which are essentially inbred lines since goldenberries do not cross easily. Thus genetic material is available for crop improvement. The 2018 growing season in the Mid-Atlantic and Northeast regions was exceptionally wet, with frequent rain and significant temperature fluctuations. Overall, the growing season was considered fair / poor with respect to crop productivity. The number of fruit produced per plant, the average fruit size (g) and the estimated yield per plant (fruit number X average fruit size) were evaluated via an analysis of variance considering the split-split-split plot design. Treatment means were separated using Fisher’s Protected LSD when appropriate. A significant genotype X pruning interaction was detected for the number of fruit produced per plant. Table 3.1. The average number of fruit produced per plant for two goldenberry genotypes grown on white or black plastic mulch, with or without trellising, with or without pruning. Pruning the Tradewinds Fruit genotype reduced the number of fruit produced per plant while pruning Schoenbrunn Gold had no effect on fruit number. Pruning, which consisted of removing all suckers and shoots below the first bifurcation of the main stem, may have altered the vegetative / floral balance of the smaller fruited genotype or simply removed potentially flowering shoots from the plants. Neither mulch color nor trellising affected the number of fruit produced per plant. A significant mulch color X trellising X genotype X pruning interaction (∝ = 0.02) was detected for average berry weight. To elucidate the trellising, genotype and pruning effects a separate analysis was performed for each mulch color. Two significant treatment interactions were detected for plants grown on white mulch: (1) pruning X genotype and (2) trellising X genotype (Table 3.2). Table 3.2. Interactive effects of pruning X genotype and trellising X genotype on average fruit size of goldenberry grown on white plastic mulched beds. zMean separation within column and either pruning or trellising effect via Fisher’s Protected LSD, ∝ = 0.05. Pruning enhanced fruit size of Schoenbrunn Gold but not Tradewinds Fruit. Trellising reduced fruit size of Tradewinds Fruit but had no effect on Schoenbrunn Gold fruit size. A significant main effect of genotype was detected on black mulch. Schoenbrunn Gold fruit were significantly larger than Tradewinds Fruit fruit (7.6 and 2.9 g, respectively). A significant trellising X pruning interaction was detected for fruit size for plants grown on black mulch (Table 3.3). Table 3.3. The effect of pruning and trellising on fruit size of goldenberry grown on black plastic mulched beds. zMean separation within row by Fisher’s Protected LSD, ∝ = 0.05. Pruning increased fruit size without trellising bud had no effect when plants were trellised. Significant genotype X pruning and pruning X trellising interactions were detected for estimated yield per plant (Table 3.4). Table 3.4. Estimated yield per plant for two goldenberry genotypes grown on white or black plastic mulch, with or without trellising and pruning. z,yMean separation within column by Fisher’s Protected LSD ∝ = 0.05. Pruning enhanced estimated yield of Schoenbrunn Gold but not Tradewinds Fruit. When plants were trellised, pruning had no effect on estimated yield, however, when plants were not trellised, pruning significantly enhanced yield per plant. Overall, we have identified several promising genotypes for further evaluation and determined that the added expense of white mulch is not warranted for goldenberry production. We have also identified two major plant characteristics needing improvement : earliness to harvest and yield. The effects of trellising and pruning varied. A general production observation is that trellising eases goldenberry management and field access. Pruning also facilitates field maintenance and may also increase fruit size. Even though pruning may reduce fruit number per plant, the benefits in field maintenance observed warrant the reduction in fruit number per plant. Based on these results, we recommend growing goldenberries on black plastic mulch, with a simple trellis and pruning plants until the first bifurcation of the main stem. 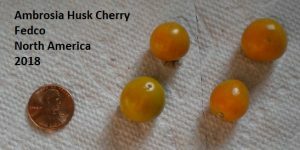 The genotypes we will be evaluating in 2019 with pruning variations will include Schoenbrunn Gold for its flavor and Golden Inca Berry – The Rare Vegetable Seed Consortium (OP seed from Rutgers) and Cape Gooseberry – Rare Exotic Seeds (Obtained 2018) for their consistency in fruit color and overall appearance. We will also repeat experiment two, however, on a smaller scale than in 2018. We will provide growers seeds of Schoenbrunn Gold (large fruited genotype) and Cape Gooseberry from Rare Exotic Seeds (small fruited genotype) for trial in 2019. Additional grower participants will be recruited at the Mid-Atlantic Fruit and Vegetable Convention in Hershey Pa, January 2019 and the New Jersey Agricultural Convention and Trade Show Atlantic City, February 2019 during presentations scheduled for both meetings. Two grower presentations highlighting goldenberry production are scheduled for The Mid-Atlantic Fruit and Vegetable Convention in Hershey, PA in January 2019 and the New Jersey Agricultural Convention and Trade Show in Atlantic City, in February 2019. ‘The Sustainable Goldenberry Production Guide’ scheduled for publication in late 2019 will provide growers all the information they need to successfully grow goldenberries in the Northeast. Approximately 2500 CSA/Farmers Market farmers in the Northeast receive a questionnaire regarding goldenberries. This project is described and they are invited to participate. Invitations for participation in this project were e-mailed in March 2018 to 2175 growers in the Northeast region. Two hundred four growers responded requesting seeds to trial during the 2018 growing season. One thousand growers request seeds to try goldenberries in the 2018 growing season (15 December 2018). Two hundred four growers responded requesting seeds to trial during the 2018 growing season. Each grower received 25 seeds each of Schoenbrunn Gold and Tradewinds Fruit Goldenberry along with instructions for raising transplants. A separate Goldenberry Fact Sheet was e-mailed to all participants in April 2018. Growers were requested to provide comments and opinions regarding goldenberries, but few did so. However, approximately 15 growers provided valuable information regarding their experience with the crop. Five hundred growers decide to continue and request seed packets with production recommendations to trial the fruit and offer it in their share / sales (1 June 2019). Three hundred fifty (350) participants return production data information online indicating their sales and whether or not they will continue to offer goldenberries through their CSA/Farmers market (15 December 2019). Two hundred fifty (250) growers continue participating and grow fruit a third year (1 June 2020). They return production data and indicate if they are adopting goldenberries (15 November 2020). 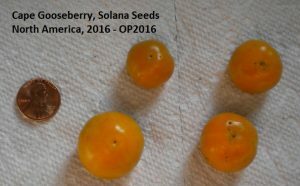 A Specialty Crops Research Initiative (SCRI) pre-proposal “Accelerated Improvement of Goldenberry and Groundcherry: Ripening the Potential of Underutilized Fruit Crops” was submitted to the USDA in December 2018 with The Boyce Thompson Institute, Cold Spring Harbor Labs, Cornell University and The University of Florida.